Great, you've identified your window! Are you looking for VELUX® blinds for your loft windows? Then you have certainly come to the right place! At loft blinds all of the products we sell are 100% genuine VELUX® roof window blinds. We have a complete range for many different roof window models. We also have a large variety of colours and patterns. We have many different VELUX® blind accessories in stock. We also offer all of our customers fabric swatches at no extra cost. Plus, we provide a fast, proficient and safe delivery service. 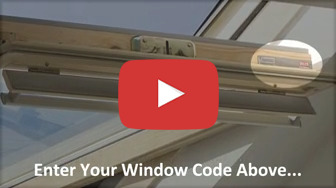 All you need to do is fill in your windows code into our VELUX® blind builder, choose your preferred style and colour and then you will have your new roof blind sent to your door within days. Please rest assured that our products are the real deal and that we only sell authentic VELUX® window blinds and nothing else. For extra clarification our roof blinds have serial numbers clearly displayed when purchasing, so that you can have peace of mind that they will be the perfect fit for your VELUX® windows. Please note: we get our stock directly from VELUX® itself in Denmark and have been a agent of theirs for over 30 years. Get free VELUX® blind swatches before you buy! We understand it can be difficult to pick a colour or pattern online for your roof blind and getting it right is so important and you need to be sure it will complement your rooms décor! So, at Loft blinds we are more than happy to send you up to five free fabric swatches to help you make that all-important decision. We also go that little bit further and not only offer you the option of free colour swatches but also VELUX® blind swatches, so you can see the quality of not only the colour but the texture of the fabric as well. To order your free swatches please use our blind builder at the top of the page and select the samples you would like sent out to you completely free for charge. Order through our blind builder. Here at Loft blinds we are all about what makes our customers shopping experience enjoyable and stress free and this is why we are proud to offer our customers a fast and simple way to purchase your loft blinds. Then you can pick your preferred colour or pattern, add to basket and checkout. It is really as simple and as quick as that! No hassle, no fuss and top-quality VELUX® roof blinds winging their way to you! Below you will find a list of common question we occasionally get asked by customers. If you have a question, we have not answered below then by all means get in touch, our friendly sales team will be happy to assist you. How long are these guaranteed for? All our products are guaranteed for three years from date of purchase. Where do I find my window code? If you open your window and pivot it until you can see the locking mechanism at the top. You will see a data plate with your windows information. We offer free delivery to all our customers unless your order total is under £50 where by you will be charged a flat rate of £4. Why do some orders take 5-7 working days and others only 2 working days to deliver? VELUX® is a Danish Company, therefore many of the items we sell are directly shipped from Denmark. However, most of the more popular colours, sizes and types are stocked in our UK warehouse so we can guarantee a 2-working day delivery. Please ensure you check delivery times upon checkout as we clearly mark 48 Hrs delivery on the blind selector page. What courier do you use to deliver my order? We use Parcel Force to deliver your roof blinds safely to you. My item is faulty, what happens now? In the very rare occasion that you find your order is faulty, we offer a three year no quibble warrantee. Get in touch with us and we will arrange for a new replacement to be sent out to you free of charge. Please read our terms for more info. I have ordered the wrong item, what should i do? Do not worry these things happen! Once you have realised your error please get in touch with us and we will arrange for your item to be collected and refunded. You can then go on to order the correct item. For more info please read our terms of sale. Can you advise what would be suitable for bedroom loft windows? If you want to block out light, then our Velux blackout blinds are great for roof windows. We would recommend the blackout, energy or duo blinds, they will all help keep any unwanted lighting out. Can anyone install your roof blinds? Yes, you can - they are extremely easy to install, and you can put your VELUX blinds up in a matter of minutes, however if your loft windows are at a high level then it would be advised to seek the assistance of an experience installer. What is a rod controller used for? The ZCT Rod controller is primarily designed for opening high level roof windows. The rod can be used for operating your blinds when in conjunction with a ZOZ Adaptor, for more info on our rod controllers please ask. Buy your perfect blinds from a reputable company, you can read our glowing reviews on Trustpilot to ensure you are in great hands. However, f you do have any questions or require further assistance regarding your VELUX blinds then please contact our friendly sales staff who are here to help. Our operators are available from 10am to 3pm Monday through to Friday.